The Sleep Easy Hostel has many rooms, you can choose the best one according to your needs : Two Twin (sharing the same bathroom), 3 dorms (with 6 beds with private bathroom or with 5 beds with private bathroom). 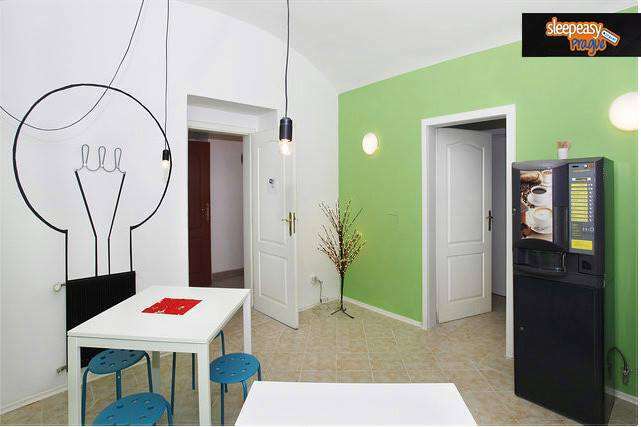 Sleep Easy Hostel is very close to the center of Prague is easily accessible by public transport (24 hours out of 24). The area is very quiet and there is a new hostel, ideal for all types of travelers looking for lowcost prices. The reception is open 24/7, there is a luggage room, a lift and free wifi in the common room. All rooms have single beds (not bunk beds), bed linen is provided free of charge, only towels for hire. Room amenities include: a desk with chairs, a refrigerator, a sink. There is a common room that guests can use to meet other backpackers and where free wifi is free. from the airport "Vaclav Havel"
bus 119 to Dejvicka - walk to ' Dejvicka-Vítězné namesti' 3 mins, then Trams 5, 26 to Husinecka (9 / 11 stops ) then walk about 6 mins to Dalimilova 14 (450mt). from the main train station "Hlavní Nádraží"
Trams 5, 9, 26, 55, 58 , 'Husinecka' (1 stop) then walk about 6 mins to Dalimilova 14 (450mt). from the bus station "UAN Florenc"
Bus 133, 175, 207, 'Tachovske Namesti' (2 stops) then walk about 4 mins to Dalimilova 14 (300mt). Cancellation/ prepayment policies cancellation or modification free of charge if done until 2 days before arrival, less a fee of 100% will be charged. All children are welcome.Free! One child from 0 to 2 years stays free of charge when using existing beds. There is no capacity for extra beds in the room.